A mom whose kids are on the same summer league swim team as my kids sent me a facebook message earlier this week saying that she needed a birthday cake for her youngest daughter's third birthday party this weekend. So, I asked her to send me the photo of a cake she said she had found online and loved. 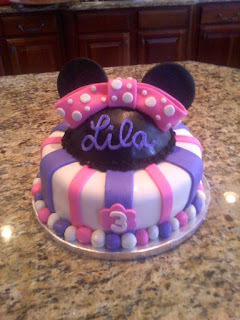 I was delighted to see this fun Minnie Mouse theme, and re-create it for them. This was my very first attempt at MAKING my own fondant, and I have to say, I was really pleased with the results. I used the recipe from Peggy Weaver's Baking Corner. I followed the directions exactly for the first batch that I made, and it made good fondant, but a HUGE mess!! For the second batch, I mixed it in my KitchenAid stand mixer with the dough hook. Much better! Love it!! I'm planning to make a similar cake this weekend for a 1-year party. Would you tell me what you did the ears out of? I'm thinking of using cookies, but I'm not sure that the cake can hold the weight. Thanks!! Thanks, Steph! It was a fun cake project for me. I just made the ears out of black fondant. If you do that too, just be sure to make them a few days in advance so they have time to dry! I'm sure cookies would work just fine too. Good luck! Hi Kelley! Adorable cake! Good to know you can make the marshmellow fondant in the mixer! Did you need the crisco still to do it this way? I'm making one for our 3 year old for her birthday this weekend. Thank for posting!